Scarborough Construction Skills Village was proud to attend its first Scarborough Engineering Week from Tuesday 9th October to Thursday 11th October 2018 at Scarborough Spa. 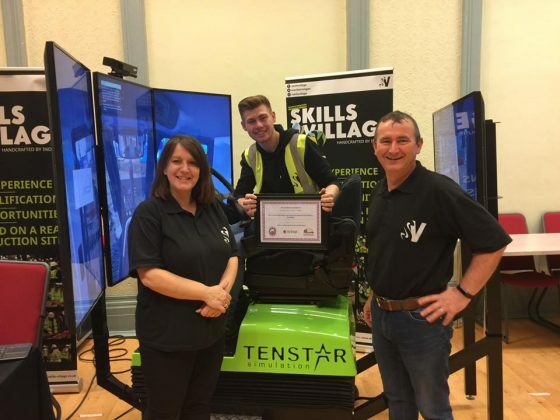 The Construction Skills Village had a dedicated stand with information on careers in construction as well as a plant simulator to provide visitors with a first-hand experience of working in the industry. Our interactive stand was a huge success, often with queues of visitors wanting a go! We were honoured to receive Winner of Best Interactive Stand at Scarborough Engineering Week 2018 as voted by this year’s visitors. This was the first year Scarborough Engineering Week has had a dedicated stand for construction and we are delighted to be the first company to showcase the great opportunities in the industry. Scarborough Construction Skills Village has been successful in securing funding to keep a plant simulator on our site and we hope to have this in the coming months. This is fantastic news for both the Construction Skills Village and the local people of Scarborough who will have access to this innovative piece of technology. The team look forward to seeing everyone at Scarborough Engineering Week 2019!